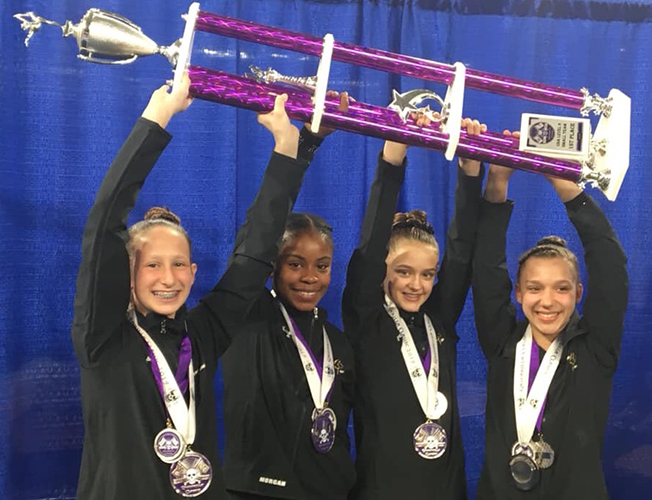 Bright Raven Level 7/8 Gymnasts brought home a total of 12 gold Medals from the USA Women’s Gymnastics State Championships held March 8-10th in Buffalo, N.Y. In the Level 7 Junior Divisions, Nyla Ragland of Spencerport earned gold on vault, uneven bars and all-around and silver on balance beam. Meredith Fingler of Chili earned gold on floor exercise. In the Level 7 Child Divisions, Mary Sack of Spencerport took first place on balance beam and second place on vault. Kylie Montague of Avon was first on uneven bars and third place all-around. Level the 7 Senior Divisions, gymnast Madison Maas of Churchville took first place on bars and second place all-around. Megan Robinson of Geneseo was second on floor exercise, third on uneven bars and third all-around. Madison Isenberg of Brockport placed third on vault. 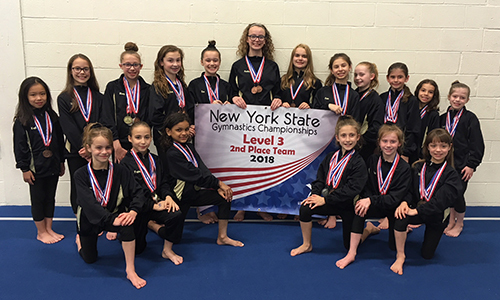 With 64 New York State teams represented, Bright Raven earned third place just behind New York City Elite and Mid Island Gymnastics of Hicksville. In the Level 8 Senior Divisions, Kylie Rozzi of Spencerport placed first on balance beam, floor exercise and all-around and second place on vault. Abby Wilkins of Pittsford was first on the uneven bars and Cameron Kull, also from Pittsford, placed third on vault. In the Level 8 Junior Divisions, Jillian Ambler of Fairport was first on balance beam, second on floor exercise third on bars and second all-around. Sophia Daeschner of Spencerport placed fourth on balance beam. In the Child Age Division, Ashley Wood of Henrietta was second in the floor exercise. 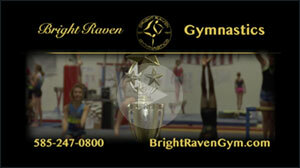 Out of the 52 Level 8 teams represented from around the State, Bright Raven placed ninth. 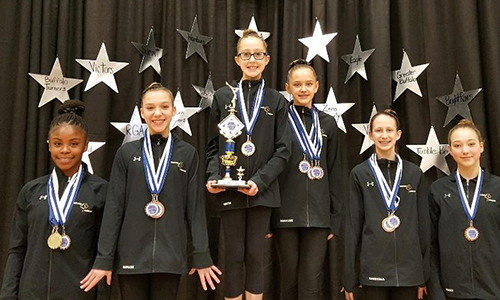 Based on their performance at the State Championship meet, five members of the Bright Raven Competitive Team will advance to the Regional level to compete in Springfield Massachusetts April 6-7th. 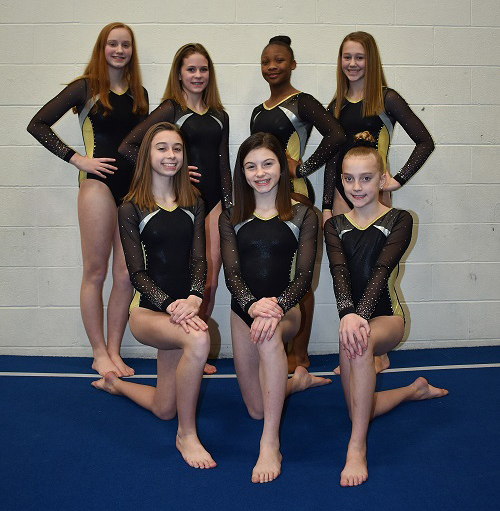 Those gymnasts representing Bright Raven Gymnastics are Kylie Rozzi, Jillian Ambler, Nyla Ragland, Mary Sack, and Kylie Montague. The Bright Raven Boys Team is officially at their mid-season mark. All levels have shown steady improvement over their first four competitions. 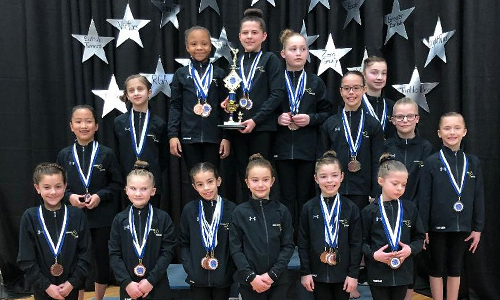 The Level 4 Team placed 2nd at the Candy Cane Classic and 3rd at the Gold Star Invitational where Elliot Sonneville led the team by winning 1st Place All-Around. The Level 5 Team finished 3rd at the Candy Cane Classic, and at the Gold Star Invitational, Sam Cohen place 2nd all around. Our new Junior Developmental (JD) team has competed this season for the first time with Charlie Dovichi placing 1st All Around at the Gold Star Invitational. The Level 6 Team won 1st Place at the Candy Cane Classic and 2nd Place at the Gold Star Invitational. Milo Anderson led the team by winning 1st Place All-Around at both competitions. Kash Ames and Alex MacFarlane have both won 2nd All-Around thus far. 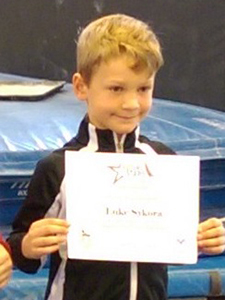 Luke Sykora has placed 3rd All-Around at both competitions. The Level 7 Team won 1st Place at the Candy Cane Classic, where Mateo Poole lead the team by winning 1st All-Around. The Level 10 Team took 2nd Place at the Candy Cane Classic and 3rd Place at the Gold Star Invitational. At the Gold Star Invitational, Justin Ciccone won 2nd Place All-Around and Ethan Rio won 1st Place on High Bar. Moving Forward these young men are preparing to compete at the New York State Championships, hosted by Bright Raven. The State Championships will be held March 16th-17th at the College of Brockport. 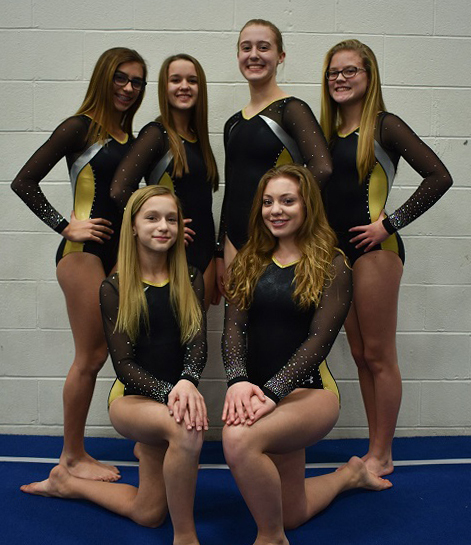 The Levels 6 and up gymnasts will compete to qualify to the Regional Championships in April. 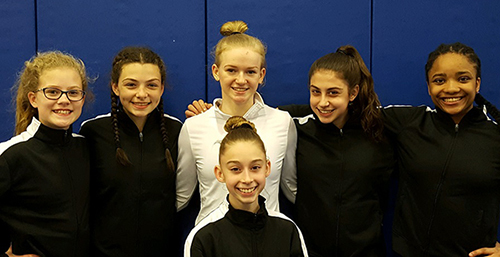 At Regionals, the Level 10 gymnasts will compete to qualify to the Junior Olympic Nationals Championships in Reno, Nevada. There, Justin Ciccone will also compete in the Junior Elite division with aspirations to qualify to the U.S. Championships. 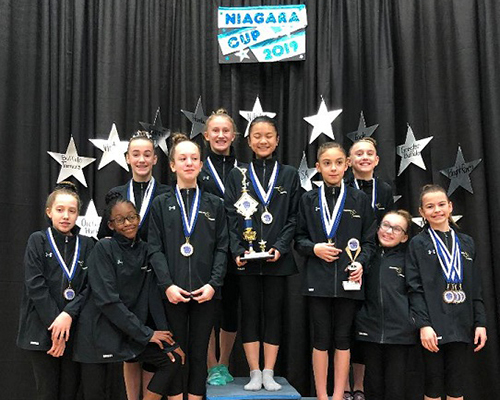 Bright Raven Gymnastics girl’s teams traveled to Buffalo January 25-27 for the 38th Annual Niagara Cup at Canisius College where they earned seven team awards along with many individual honors in their respective divisions. The Level 3 Team brought home the first place team trophy with Elliana Visca of Spencerport taking first on vault, bars and all around. Maayan Nachshom of Rochester was first on floor exercise. 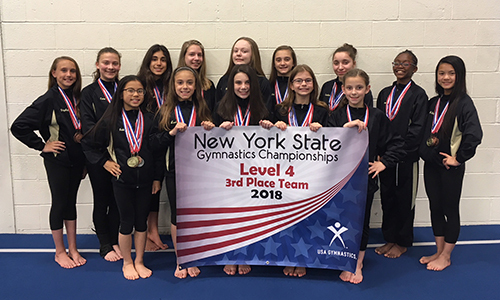 The Level 4 team finished in third place with Heidi Tran of Gates winning vault, beam and all around and Abby D’Ambrosia of Brockport winning bars. Skylar Williamson of Chili took first place on balance beam. The Level 5 Team captured first place with Katie Bradfield of Spencerport earning first on beam and all around. Lia Brasacchio of Victor was first on bars and Kailey Tran of Gates earned first on both vault and floor. Hannah Prince of Greece was first on vault and Maya Thomas of Penfield was first on bars. Alexis Gerig of Greece took first place bars, beam and all around. Kennedi Gadsden of Greece was first on vault and floor. The Level 6 Team was first with Morgan Sizer of West Henrietta taking first on vault, bars, floor and all around. Caroline Garbe of Webster was first all around, Gabriella White of Greece was first on bars and Katie Kull of Pittsford was first on floor. 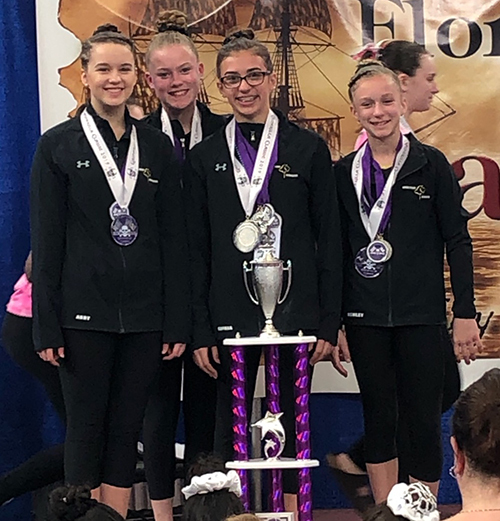 The Level 7 Team brought home another first place team trophy with Nyla Ragland of Spencerport earning first all around. Megan Robinson of Geneseo was first on floor and Madison Maas of Churchville was first on floor. The Level 8 Team placed third with Ashley Wood of Henrietta taking first on floor. Jillian Amber of Fairport was first on beam and Kylie Rozzi Spencerport was first on floor and all around. The Level 9 Team took second place. 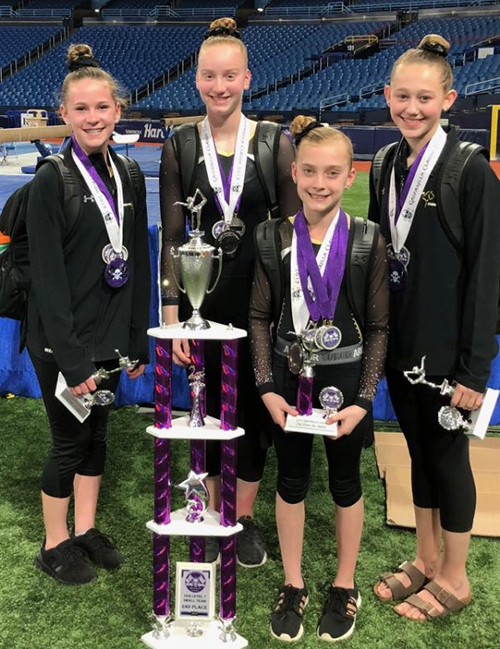 Emma Hopsicker of Brockport competed as an Xcel Platinum division taking first all around and Megan Corcimiglia of North Chili earned first on vault in the Xcel Silver competition. 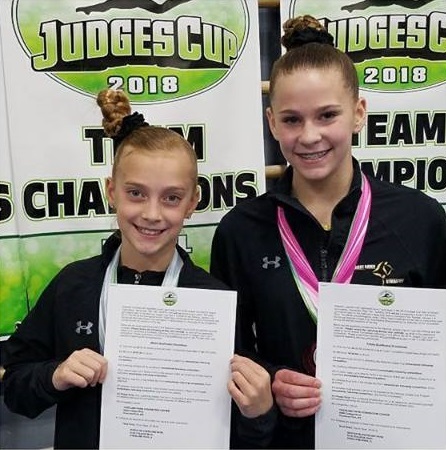 Bright Raven Gymnasts, Meredith Fingler of Chili and Kylie Montague of Avon qualified to represent the New York North Chapter of the National Association of Women’s Gymnastics Judges at the National Judges Cup to be held January 4 – 6 in Overland Park, Kansas January 4 – 6. 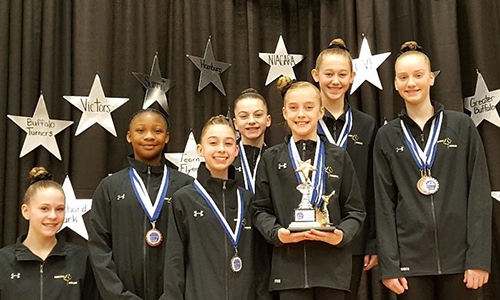 Only the top six Level 7 all around competitors from the Upstate Judges Cup held in November earned the opportunity to represent Upstate New York at this prestigious National competition. Meredith Fingler, age 13, competed in the Junior division taking first all around, first on vault, second on bars and first on floor exercise. 11-year-old Kylie Montague competed in the Child Age division and placed second on bars and fifth all around. 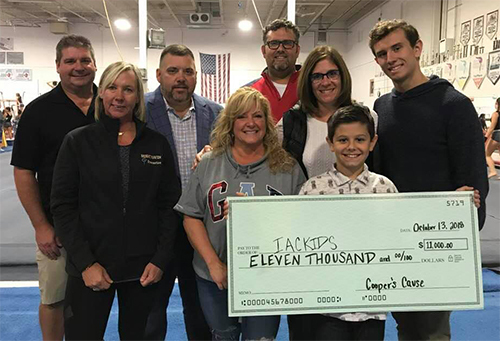 Bright Raven Gymnastics and Gracie’s Catering organized another successful Cooper and His Cause Golf Tournament on September 23 at Salmon Creek Country Club. The proceeds of the tournament in the amount of $11,000 were presented to the IAC Kids Organization (It’s About Caring for Kids). IAC Kids provides financial support to families in the Rochester area with children suffering a serious illness. Young Cooper LeMere of Brockport was diagnosed with Type B Acute Lymphoblastic Leukemia (ALL) at the age of 4. Cooper is now 8 years old and cancer free. This is the third year for the Cooper and His Cause Golf Tournament with each year’s proceeds exceeding that of the previous year. 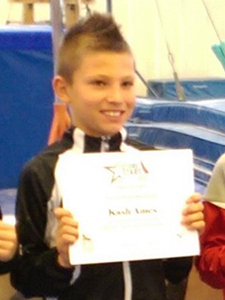 Bright Raven gymnasts, Kash Ames and Luke Sykora both qualified to the Region 7 Future Stars Elite Team at the USA Gymnastics Regional competition held in Harleysville, Pennsylvania September 30. The boys competed among gymnasts from Delaware, Maryland, New Jersey, Pennsylvania, New Jersey, Virginia and West Virginia in addition to New York. In the 9 year old division, only the top six gymnasts were named to the team. Kash Ames finished third and Luke Sykora placed sixth. 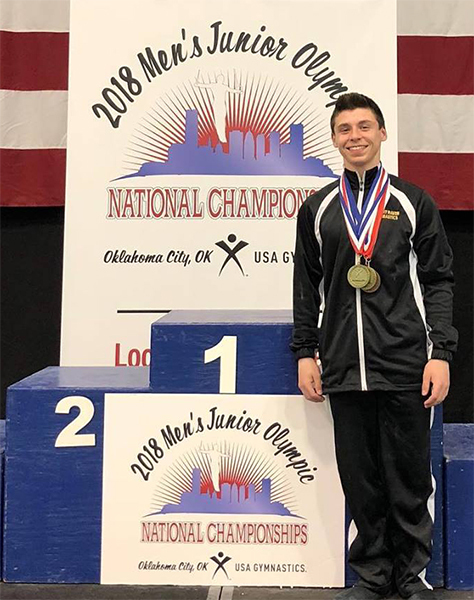 Bright Raven Gymnastics Boys Team member Justin Ciccone of Greece became a four-time Level 9 National Champion at the Junior Olympic National Gymnastics Championships in Oklahoma City, OK in May. Justin placed first on the Floor Exercise, Vault, High Bar, and All-Around along with a fifth place finish on the Rings. Also competing at the National Championships in Oklahoma were team members Ethan Rio of Avon and Cole Pringle of Pittsford. 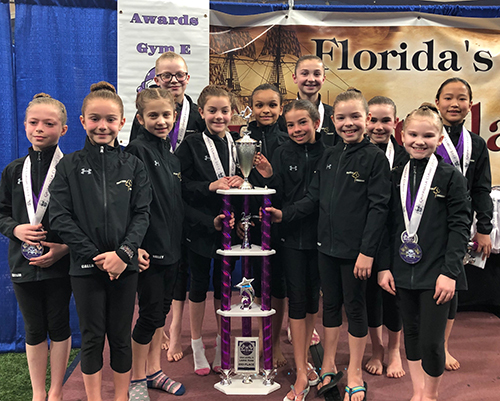 At the Regional Championships in Lincroft, NJ in April the Bright Raven Gymnastics Level 9 Boys Team, comprised of Ryan Dugan of Fairport, Ciccone, Rio, and Pringle, placed second overall versus competition from across the northeast. In addition, Cole Pringle became Level 9 Regional Champion on the Floor Exercise, Parallel Bars, and High Bar. The Bright Raven Level 3 and 4 teams took second and third place, respectively with 30 teams represented at the USA Gymnastics Upstate New York Championships held in Rochester May 18-20 where many champions were named by taking first place in their respective divisions in individual events and all-around competition. In the Level 4 Child C division, 9-year-old Alexis Gerig of Greece took first place on the uneven parallel bars. In the Child D division, Kennedi Gadsden of Greece was first on the uneven bars. In the Junior B division, 10-year-old Heidi Tran of Gates was first on both floor exercise and all around. In the Junior C division, Hannah Prince of Spencerport was the champion on the uneven bars. 12-year-old Kailey Tran of Gates took first on floor exercise in the Senior B division. In the Level 3 Child C division, 8-year-old Samantha Clyde of Spencerport earned first place on both balance beam and floor exercise. Rachel Lynck of Chili was first on floor in the Child F division. In the Junior A division, Skylar Williamson of Chili earned first place on balance beam. In the Junior B division, Caitlin Nowak of North Chili was first on bars, beam and all around. Elliana Visca of Spencerport was first on floor in the Junior D division and Sophia Hogan of Greece took first on the uneven bars in the Jr E division. 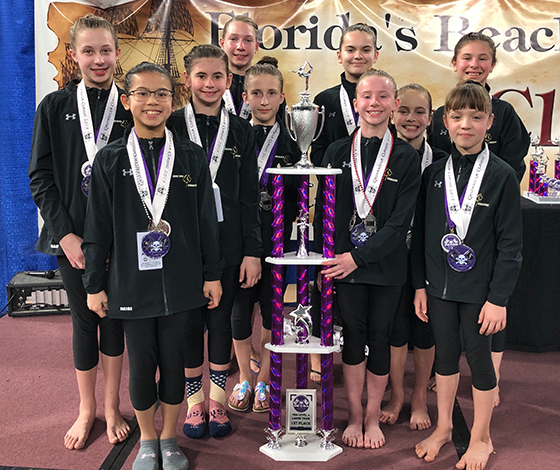 In the Senior A division, 10-year-old Isabella Curtis of Avon was a four time champion, taking first place on vault, uneven bars, floor exercise and all around. In the Senior B division, Peyton Petrillo of Brockport was first on both the uneven bars and all around. Mary Cook of Brockport earned first on the uneven bars in the Senior C division and Eva Meddaugh of Greece was first on floor exercise and all around in the Senior E division.